Data center management professionals often are haunted by the specters of human error and inefficiency. Whether you’re worried about lowering power and energy costs or keeping track of moves, adds, and changes in your asset inventory, it’s easy to see how today’s data centers could induce chills in even the most seasoned managers and operators. Struggling through the volume and variety of data collected from your data center may leave you feeling like a zombie. Fortunately, a well-configured set of dashboards, with each dashboard tailored to specific business goals or KPIs, can help you discern and analyze the relevant information with a clear head. Real-time visualizations aid in quickly discovering meaningful connections among data, and trending and forecasting allow you to predict and plan for future data center management needs. Want to dig deeper into your data for more meaningful insights? Drill down to the raw data that drives the chart in tabular format for fast and easy interactions or exports. Want to avoid the fear of employees' wreaking poltergeist-like havoc on your meticulously planned moves, adds, and changes? Transparent workflows streamline change and asset management so your information is always accurate and up to date. Automating request processes similarly ensures that work orders are approved and completed free of errors, while integrating a reservation system that confirms space and capacity before accepting a change request adds peace of mind to your data center management. For remote deployments, add multiple requests to a single work order to save time on trips to the data center. A locked cabinet door might not keep out ghosts and apparitions, but it will deter unauthorized gremlins from making mischief in your data center. Door access management that confirms when a door is closed and locked adds an additional level of physical security to your data center. And managing door access remotely means you won’t need to drive to the data center to just make sure the doors are shut tight. During a ghost hunt, thermal imagery might be considered the tool of choice for paranormal investigators. If you’re looking to save money and energy managing the temperature in your data center, the ability to visualize hot and cold spots can be equally valuable. When combined with 3D visualization and time-lapse video, thermal maps can enable you to chronicle environmental trends, visually capture thermal performance, and pinpoint hot spots. The potential for critical business systems to go down can be the stuff of nightmares for data center managers and operators. To determine if your data center can survive a power apocalypse without impacting equipment, simulate failover and analyze the resulting capacity reports. Based on your analysis, you can take appropriate steps to avoid significant downtime. Data center infrastructure management (DCIM) software provides a platform where you can manage your dashboards, door access and security, environmental sensors, asset inventory, and other critical elements of your data center. DCIM brings all of these components together in a single-pane-of-glass view to give you a complete picture of your data center so you can handle spooks before they become problems. 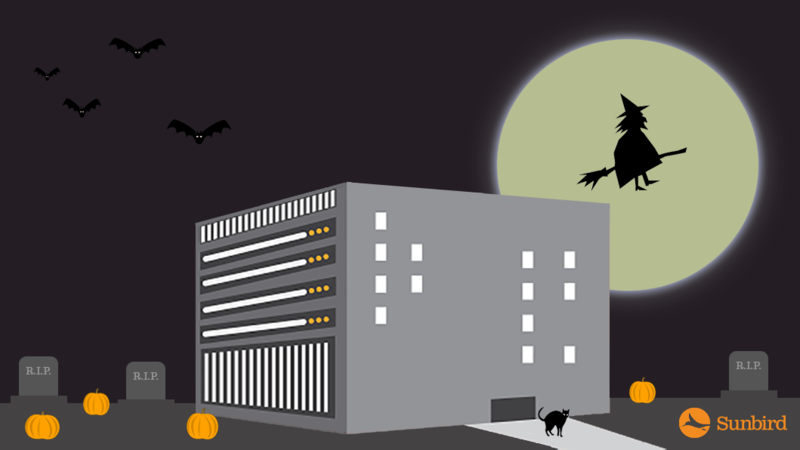 Employ these simple tips with DCIM software, and you’ll be on your way to fright-free data center management so you can sleep like the dead. Want to see for yourself how DCIM can exorcise the ghosts of inefficiency from your data centers? Test drive Sunbird’s DCIM software today. Originally published October 31, 2016. Updated October 20, 2017.